All: God of life, wholeness and holiness, you who direct all creation to its fulfillment in Jesus, the Christ – open our hearts to the message of the Gospel so that your peace may rule in our hearts and your justice may guide our lives. Loving God, we pray that you impart your wisdom to all people, especially world leaders, to care for and protect our planet Earth. Loving God, bless all of us gathered here and all those of our community who are not with us today. We ask this of you, our brother Jesus, and our sister Sophia. Amen. All: (with an outstretched arm): God, our Father and Mother, help us to hear Wisdom’s messages, to faithfully understand them, and to receive the compassion to act on them with our brothers and sisters. Compassionate God, teach us the virtues of pardon and peace so that we may – in turn- learn to forgive our failures to care for one another and for our planet Earth. We ask this of you in the names of Jesus, our brother and of the Holy Spirit, our healer and comforter. Amen. First reading: A Reading from “The Orchid Thief” by John Laroche. All: Thanks be to God. Second reading: A Reading from “Messages From Mother… Earth Mother” by Mare Cromwell. All: Glory and thanks to our God. Earth Gospel: A Reading from “Radical Passion: Sacred Love and Wisdom in Action”. By Andrew Harvey. 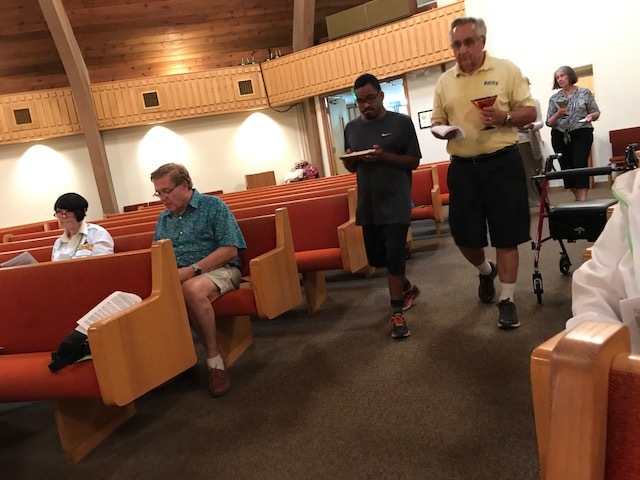 Voice 3: (Place your hand on the shoulder of the person to your right) Compassionate God, let your Holy Spirit rest upon us, your people, converting us from the patterns of the world, until we conform to the shape of him whose food we now share. All: We cannot listen to your words of peace and not grieve for the destruction of our precious earth. ALL: Thanks be to God. Let it be so! Alleluja! And we shall be just in all that we do. "Touch the Earth" Sung by Carmel Boyle, "God has given us the power to create the world anew, if we touch the earth together me and you." Fr. Roy Bourgeois, an excommunicated Maryknoll priest, human rights activist, Vietnam War Veteran, Purple Heart Recipient, and 2010 Nobel Peace Prize Nominee will deliver a presentation at St. Stanislaus Polish Catholic Church, 1413 N. 20th St. St. Louis, MO 63106 on Friday, April 21, 2017, at 7:00 p.m.
Also speaking Rev. 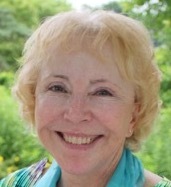 Janice Sevre-Duszynska, Association of Roman Catholic Women Priests (ARCWP), will present remarks about the women’s priest movement and her journey as a peace activist. 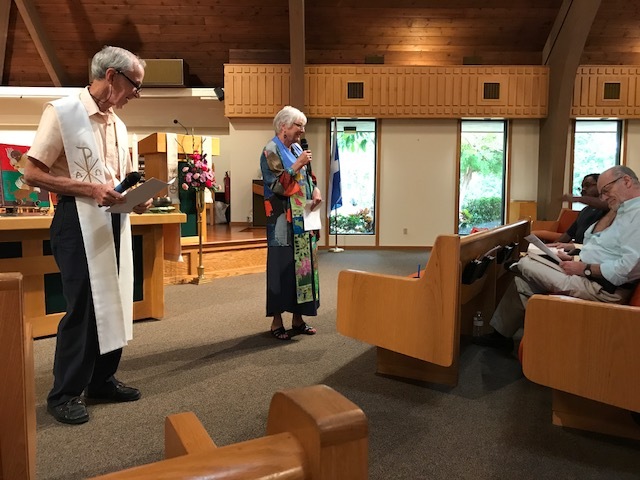 Bourgeois, the founder of the School of the Americas Watch (SOA) and 2011 American Peace Award recipient, and Sevre-Duszynska, an excommunicated activist priest, continue to champion causes of peace and social justice. Para algunxs, puede ser un escándalo, atrevido...para América Latina, no. Ha sido la oportunidad de esponjar el alma, en nuestros principios ancestrales ya reconocidos en Ad Gentes (Vaticano II), en los documentos de Melgar (1968) y el documento de Iquitos (1971) del CELAM. Irish Roman Catholic Bishop Signals Openness on Women Priests, How About a Cup of Tea and a Conversation in August? On the issue of women priests, he said: “If that’s God’s will in our day, I’m happy to accept it.” However, he added that “there is no possibility at the present time women will be priests”. 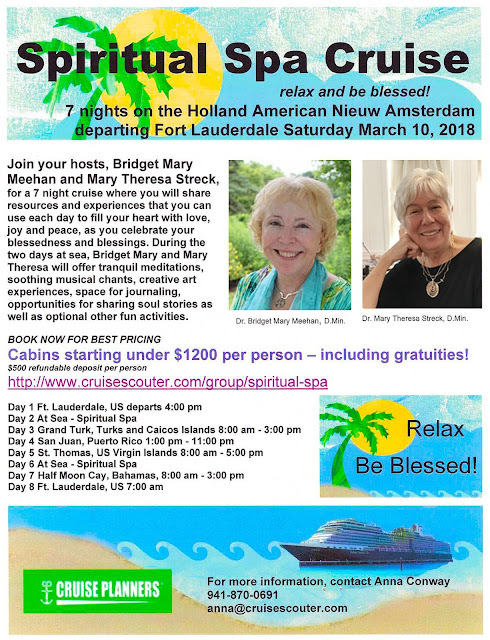 Bridget Mary's Response: Three members of the Association of Roman Catholic Women Priests will be in Ireland in August. I wonder if we could have a cup of tea and a conversation with Bishop McKeown. The sole purpose of this organization is to form and ordain priests, concentrating its efforts to reach out to those who have been marginalized by the Roman Catholic hierarchy. The movement has embraced and empowered woman, married men, and members of the LGBTQ community. 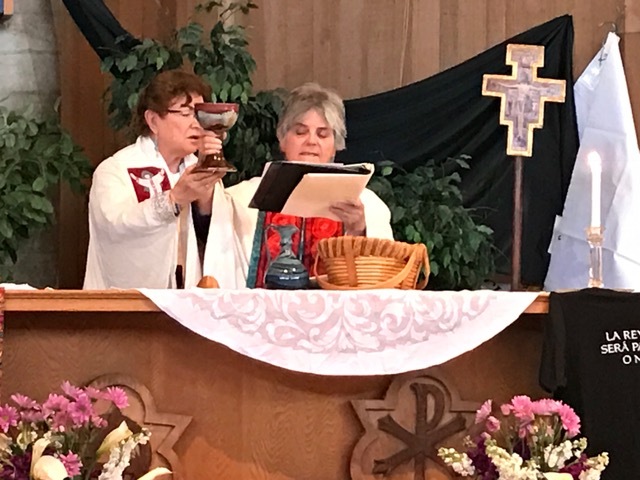 The women priest movement has grown by leaps and bounds. Tracing its roots to the seven women who were ordained by male Catholic bishops on a boat on the Danube River in 2002, this movement now boasts more than two hundred fifty priests in ten countries. The male leaders of the greater Roman Catholic Church, 1.2 billion strong, treat the women priests as nuisances: slapping us away as buzzing, irritating gnats. However, the incessant clamor for women’s rights within the Roman Catholic Church has already led to the establishment of a committee to examine opening the diaconate to women and the appointment of women to leadership positions which had previously been reserved to the all male clergy. 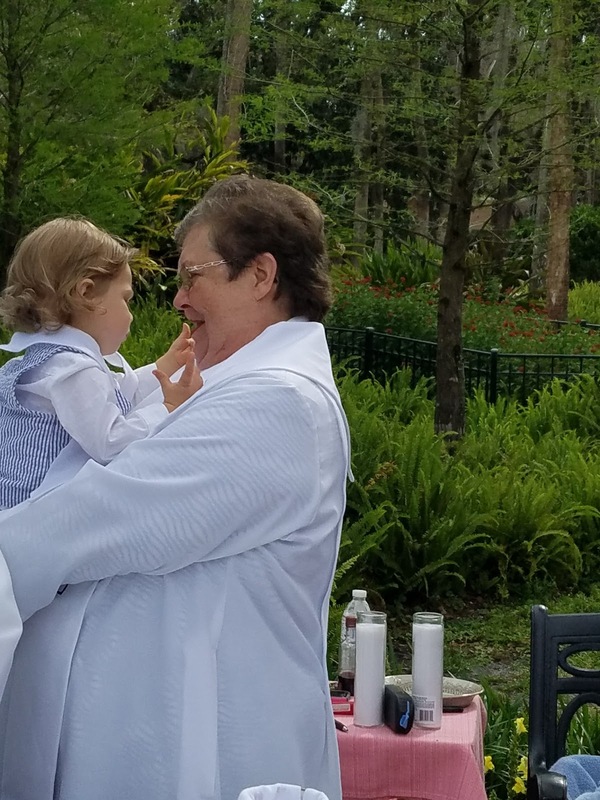 These moves in the church, which are mini-baby steps toward full empowerment, are an indication that the persistent and pesky women priests have gotten under the skin of the leadership. The leadership will complain that the buzzing and stinging women priests are driving them to distraction. However, women priests have burrowed in. In the short term, we can expect a lot of drama from the all male clergy, a lot of ineffective swipes and slaps. But the hierarchy will find that the empowerment movement is impossible to remove. In the long term, the leadership will recognize that the women priests are under its skin. Women priests will make a memorable impression on the hierarchy. The leadership will eventually reach a deep understanding of the important roles that all the baptized can preform in the church. As a result, there will be profound changes in the theological understanding of what it means to be human. 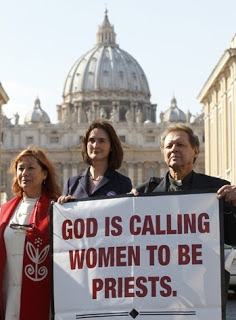 I envision a day when the hierarchy will grow to appreciate the women priest movement. 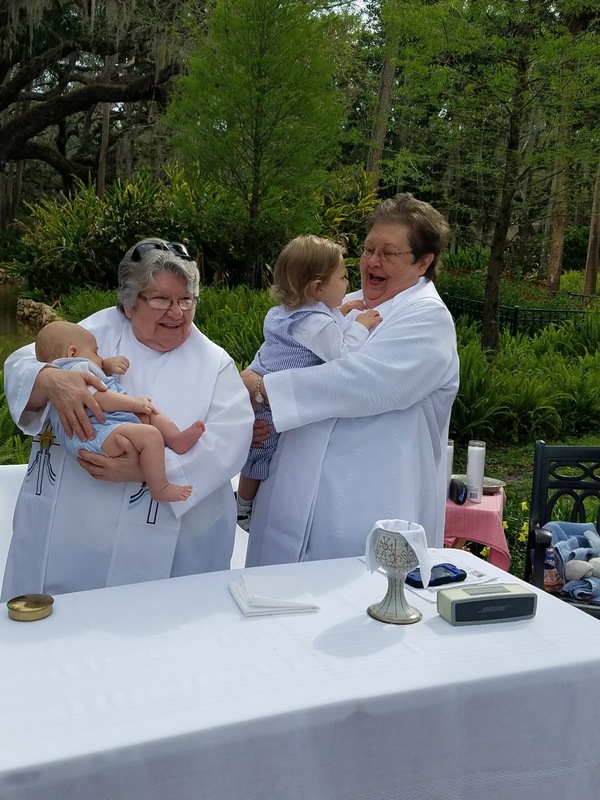 One day the church will proclaim that the women priest movement has had a strong positive effect upon the church. The woman priest movement is here to lead the church to that day. The woman priest movement is the catalyst to the formation of an empowering church. ≈ Posted a week before my ordination as a Roman Catholic woman priest. and hope is stronger than despair. N O N E S, not N U N S.
but it’s not organized religion. of writers like Richard Dawkins. as a basis for throwing everything out. Dawkins is totally certain that he’s right. when religion stops making sense to them. He’s not a “Doubting Thomas,” not at all. to experience of the divine. his doubt turns to faith. He never did put his finger in Jesus’ wounds. is telling a real story of how faith works. we can’t get away from him, either. For many years I struggled with the faith. that many of us went through before Vatican II. of the six levels of faith development helpful. and become disillusioned with their former faith. the Stage 4 folks have started to move forward. and his patience with me through those years. and grappled with all those questions. without getting stuck in a theological box. of their childhood and teen years. and that’s always the work of the Spirit. Anne LaMott said that the opposite of faith is not doubt. and living with questions and doubts. but we don’t have to know. We believe that resurrection is real. We see new life again and again. We experience hope after times of despair. When we rise, we want to help others rise. without any real worries or doubts. signs of the resurrection suddenly spring up. it rises transformed through the storms of history. from situations that seemed doomed. 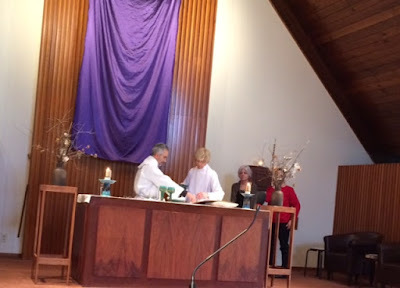 This photo of Rev, Steve Domeniiak , Priest ,at Nativity Episcopal Church and Jeni Marcus presiding at the Eucharistic Table at a Holy Thursday Ecumenical Liturgy at Nativity Episcopal Church in Bloomfield Twp. MI . In attendance were ARCWP , Bishop Michelle Birch Conery , Rev. Barbara Billey , and Candidate Karen Kerrigan . Also in attendance we're members of the Nativity Episcopal , Heart of Compassion International and St. Jeanne de Arc Faith Communities. 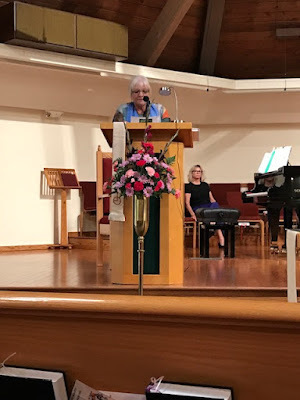 Bridget Mary Meehan's Response to Bishop Duffy in Ireland: Since there are no male seminarians, it is time for a changes, women priest! "The numbers of working Catholic priests in Ireland will halve in the next 10 years, a bishop has warned. Bishop Francis Duffy has issued a letter on the severity of the vocations crisis to all 41 churches in his diocese of Ardagh and Clonmacnoise. He has told how a priest in each parish will be a thing of the past. Bishop Duffy says a big factor in the decline is how a changing faith in Ireland is down to people becoming more private about their religion. He told the Sunday Independent that the lack of those choosing to enter the priesthood did not mean that people were turning their backs on their religion. 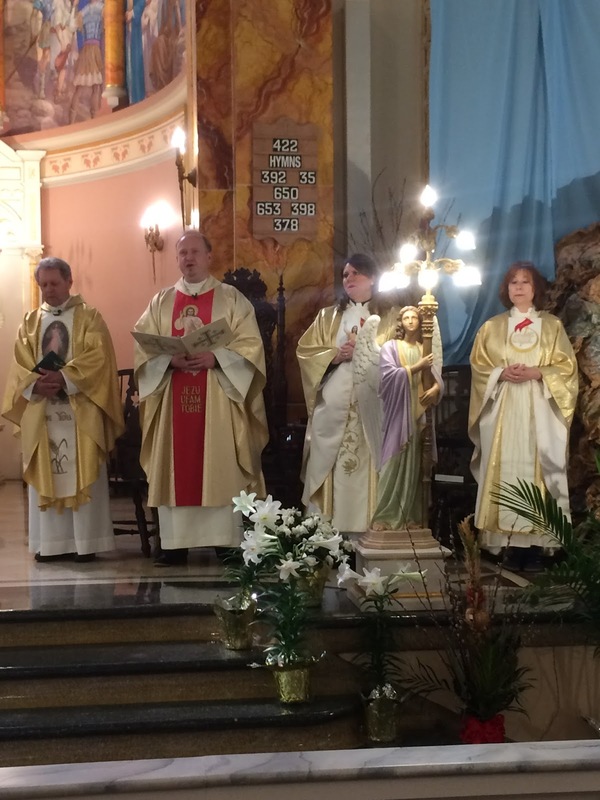 "Faith is changing," he said as he prepared for Easter in this diocese. "There is still a lot of faith in people, and they tend to use the word 'spiritual'. It is more private than public, and it is not always reflected in practice. It is a very personal issue, and I think that is important, and I say that when I am preaching. The more private dimension of faith is a strong thing. "But I think the community is important, because it is where we live and work and interact and support each other. Community worship is vital." The bishop's pastoral letter detailed how the numbers of priests will drop from 52 to 25 by the year 2030. Bishop Duffy said there are currently no seminarians getting ready to be ordained in the diocese, which covers most of Longford, much of Leitrim and parts of Westmeath, Offaly and Cavan. He said it means that by the time children born now are making their confirmation "the diocese will be a very different place". He wrote: "Many of you will fondly remember when there were two or three priests working in your parish, where now there is only one. "Three of our parishes do not have a resident priest. The trend of a declining number of clergy is set to continue. By 2030, over the next 13 years, 28 of our diocesan priests will reach the retirement age of 75. At the moment, we have 52 very dedicated diocesan priests in our parishes, but sadly no seminarians preparing for ordination." Bishop Duffy said the decline is such that we needed to prepare for a future without parish priests. Instead, the church will rely heavily on parishioners to help, he said in the letter entitled Sustaining Our Faith Community. 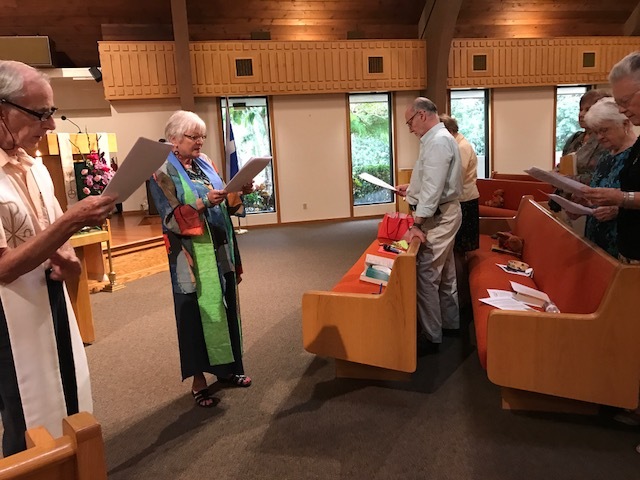 "From both a pastoral and a duty of care perspective, it is important that responsibilities our clergy now carry are shared with parishioners even more so than at present. This is not about closing churches but about reimagining how we worship and pass on our Christian faith," he said. Vatican statistics show that the numbers of priests in Ireland dropped from 5,362 in 2002 to 4,688 in 2012. With less and less seminarians, the maths show a major crisis on the cards. This year, there were just three seminarians in Ardagh and Clonmacnois, and all three left, which he described as "unfortunate and disappointing". There are many reasons for the decline, he said. "There is a hesitancy to answer a calling. Some feel it is too demanding, some feel the celibacy is too big a demand and it will be a lonely life. Others aren't ready to take the risk. "The horrendous and heinous crime of the abuse of children by clergy and how it was so badly managed, was also a big issue and had a huge impact on the view of the clergy and the church. A general mistrust of all institutions has left a lot of people questioning them." He believes parishioners can be instrumental in encouraging those who have a calling to take the jump. He said that both the issue of celibacy and of women priests are talked about a lot. But he does not believe Pope Francis has any plans to change either of those rules. 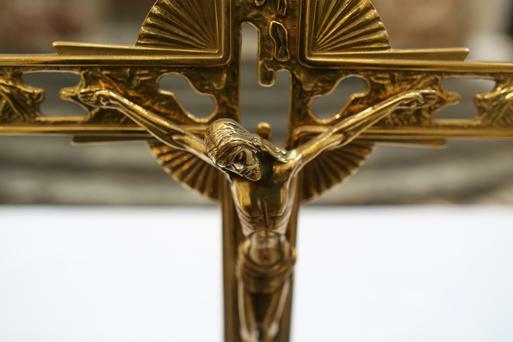 The Association of Catholic Priests has previously requested of the bishops to welcome women into the priesthood and to scrap the celibacy ban. Fr Brendan Hoban, of the ACP, said: "Doing nothing is not just irresponsible but a counsel of despair. We know who to blame if they do not bite the bullet on this one." 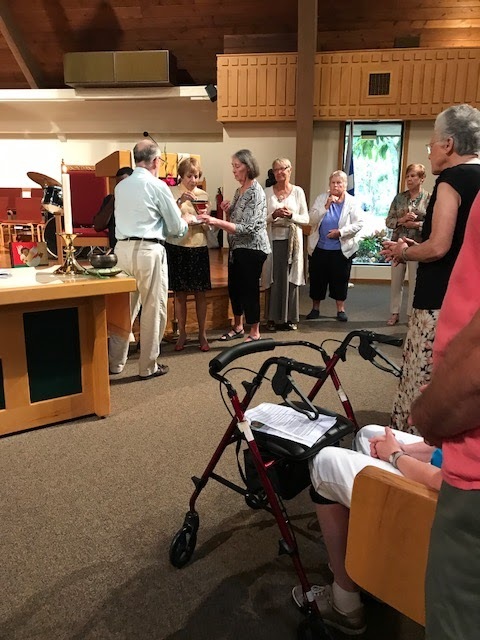 Bishop Duffy said parishioners already play a key role in church activities, and he is enormously grateful for their assistance, which he believes will save the faith. He said: "We have an extensive list of men and women involved in all sorts of ways, directly in the parish, and that is a good thing. There is a strong sense of identity and belonging in parishes in rural Ireland. That is a strength that will help us re-imagine the future." In the last census, some 3.7 million people identified as Catholic (78pc), 132,220 fewer than in 2011 when the percentage stood at 84pc. One in 10 Irish people say they have no religion (468,421 people), a 73.6pc increase since 2011. This makes 'no religion' the second largest group in this category behind Roman Catholics. In his Good Friday prayer, Pope Francis deplored the suffering of migrants. "Shame for all the images of devastation, destruction and shipwrecks which have become ordinary in our lives," he said in an apparent reference to Mediterranean migrant disasters."